Gorgeous Diamond & Sapphire Ring [SH10061] - £0.00 : loveVintageDiamonds.com, Your Vintage Diamond Dreams Come True! This is a truly gorgeous old rose-cut diamond of excellent colour and clarity, a minimum of approximately 1.20cts in weight, set in a simple four corner-claw setting with two small emerald-cut sapphires at either side of it, and a further 18 diamonds creating a boat-shaped crown. All the diamonds are extremely bright, and the 'accent' sapphires really do help to show that off in this ring. 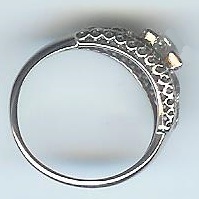 This ring is pre-1930s in age. 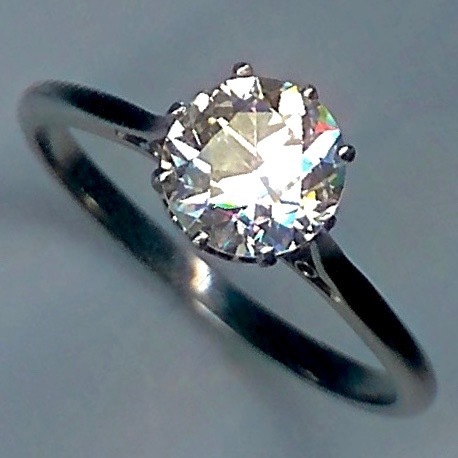 It is white throughout and, typical for its period, it is marked '10%IRID.PLAT' to indicate that it is platinum with 10% iridium, and it tests as platinum. The overall weight of the ring is approximately 3.7gms. It currently fits finger size 'M' (UK).